Perennial herb 20 cm - 1.2 m tall Stem: erect, unbranched or branched above, densely stiff-haired, nearly circular in cross section. Leaves: opposite, stalkless or nearly so, 3 - 10 cm long, 1.5 - 5 cm wide, egg-shaped to oblong or nearly round, sharply toothed, thick, stiff-haired and wrinkled above, densely hairy and veiny beneath. Inflorescence: a cluster of one to three long spikes, each pencil-like spike erect and 7 - 10 mm across, usually densely covered with flowers. Flowers: deep blue or purple, subtended by stiff-haired lance-awl-shaped bracts about as long as the calyx, calyx 4 - 5 mm long and densely stiff-haired, corolla hairy and a little longer than the calyx. Fruit: four elliptic nutlets surrounded by the persistent calyx, each nutlet 2 - 3 mm long with raised-interconnecting veins above and strong longitudinal grooves beneath. 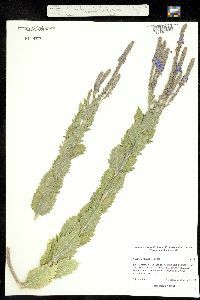 Similar species: Verbena bracteata, Verbena simplex, and Verbena stricta have one to three flower spikes per cluster and blue to purple flowers. 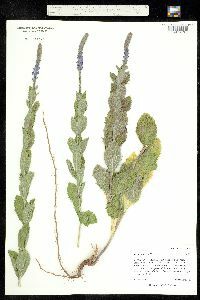 Verbena bracteata is identified by its decumbent to ascending stems, pinnately cut and often three-lobed leaves, and bracts that are longer than the calyx. Verbena simplex is distinguished by its hairless or sparsely hairy stems and its linear to narrow-oblong or lance-shaped leaves that are less than 2 cm wide. Habitat and ecology: Frequent in overgrazed gravelly pastures and sandy abandoned fields, occasional along railroads and roadsides, rare in gravelly degraded prairie remnants. Etymology: Verbena is the Latin name for vervain. Stricta means erect. Found throughout the state although there are no records or specimens from some of the central counties. It is almost exclusively found in very sandy soil along roadsides, rarely along railroads, in sandy pastures, waste places, and fallow fields. 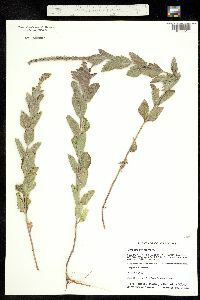 I believe it has migrated into northern Indiana, and were it not for the fact that Michaux, who spent August 18, 1795 botanizing along the Wabash River in the vicinity of Vincennes, reported finding Verbena bracteata, Verbena hastata, Verbena stricta, and Verbena urticaefolia, I should believe it had invaded the whole state in recent years. 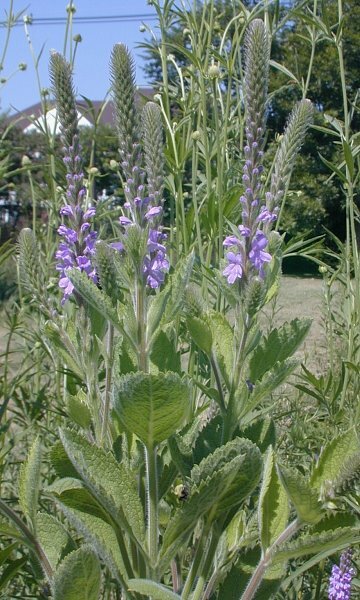 Perennial; stems 2-12 dm, subterete, rather densely pale-hairy; lvs ovate, elliptic, or suborbicular, 3-10 נ1.5-5 cm, sessile or nearly so, thick, sharply serrate to incised, hirsute and rugose above, densely hirsute-villous and veiny beneath; spikes solitary or several, long, thick, remaining compact; bracts lance-subulate, about equaling the cal, hirsute, ciliate; cal 4-5 mm, densely hirsute, its lobes acuminate; cor mostly deep blue or purple, the tube a little exserted, hairy, the limb 7-9 mm wide; nutlets ellipsoid, 2-3 mm, raised-reticulate above, strongly striate below; 2n=14. Prairies, barrens, fields, and roadsides; Ont. and O. to N.D. and Wyo., s. to Tex. and N.M., and intr. into e. U.S. from Mass. to Del. and W.Va. June-Sept.